Wait. That might be misleading. I did not get a makeover, though if anyone wants to give me one I would be more than happy to accept! No, Chef Juje the blog got a makeover, as well as a new home. You can now find me over at chefjuje.com. I’m hoping that the new site is a little more fun both for me to update and for you to read. For almost all of my husband’s life, he and his family have traveled to the southern part of North Carolina to spend a week on the beach. I was even invited last year for a relaxing week full of sand, sun and shrimp. Seriously, one of my favorite memories of last year’s vacation was the delicious shrimp and grits that his mom made for us. And although we weren’t able to go to North Carolina this year (sorry, North Carolina, your beaches took a back seat to my honeymoon), we wanted to recreate our favorite vacation dish here in Ohio. Grits are basically dried corn that is ground to a coarse meal. It can usually be found in the breakfast cereal aisle, NOT in pasta or rice as I initially tried, which makes sense because it is neither pasta nor rice. Most sources seem to agree that a 3:1 or 4:1 ratio of liquid to grits is a good rule, using lighter liquids like water or stock when heavier ingredients (cheese or butter) are used and milk with stock when making grits on their own. Start with boiling your liquid. Then reduce to low and add the grits. You should see large, slow bubbles (not rolling bubbles!) in the grits. Over time, the grits will begin to thicken and seem creamy. On left – large slow bubbles. On right – grits start to become creamy. After the grits are finished cooking, you can add your other ingredients like cheeses and butter. See Saveur “Perfecting Grits” and Bon Appetit “Grits” for more information on my new favorite corn product. Bring stock and water to boil. As soon as liquid is boiling, reduce heat to low and whisk in grits. Whisk grits quickly at first, then continue whisking as the grits cook. Should be done frequently but not constantly. Turn off heat, cover with lid and set aside. The shrimp mixture. This was a bit of an improvise-as-you-go situation. Heat pan to medium high. Cook shrimp for a few minutes until pink, turning over once. Remove from pan and set aside. Add the chopped peppers and sautee until soft. Add garlic and cook for about a minute. Add tobasco sauce, lemon juice, 1 tbsp butter and cooked shrimp. The finished shrimp and grits. I was really, really excited to share this recipe for baked zucchini sticks today. I was even a good (fine, improving) food blogger, took lots of pictures for each step along the way and was stockpiling advice for how to make such an excellent veggie dish even better. The zucchini, that is. I’m starting to think that I’m not a squash person, given past experience with butternut squash in the fall. If you’d like to try, by all means go for it and report back. The onion dip, though, was FANTASTIC. I gave up on the zucchini and started eating the onion dip with all sorts of vegetables I could find. Delicious! What are your tips and tricks for caramelizing onions? And, for moral support, what do you do when you encounter a recipe dud? Caramelize Onions. Heat 1 tbsp butter, add sliced onions, keep on low to medium low, stirring occasionally, until onions brown. Add a tiny bit of sugar if you would like. Add onions, vinegar, mustard, honey and mayo/Greek yogurt into food processor and blend. 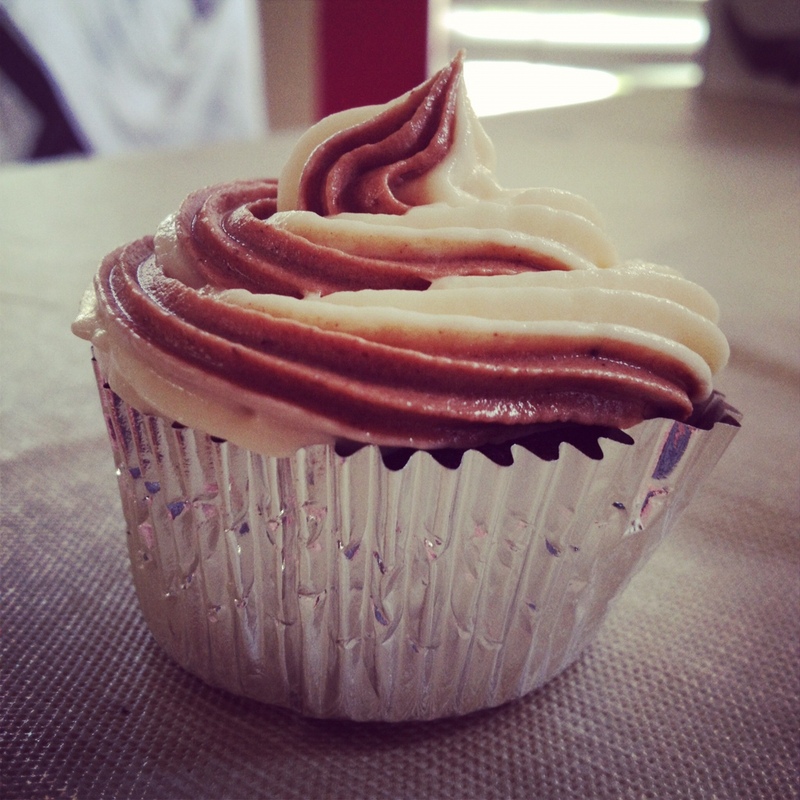 A second baking post in a row! I am learning that baking often creates giant messes (flour! mixing bowls! splatters!) and there is nothing in the world that I like more than GIANT messes. 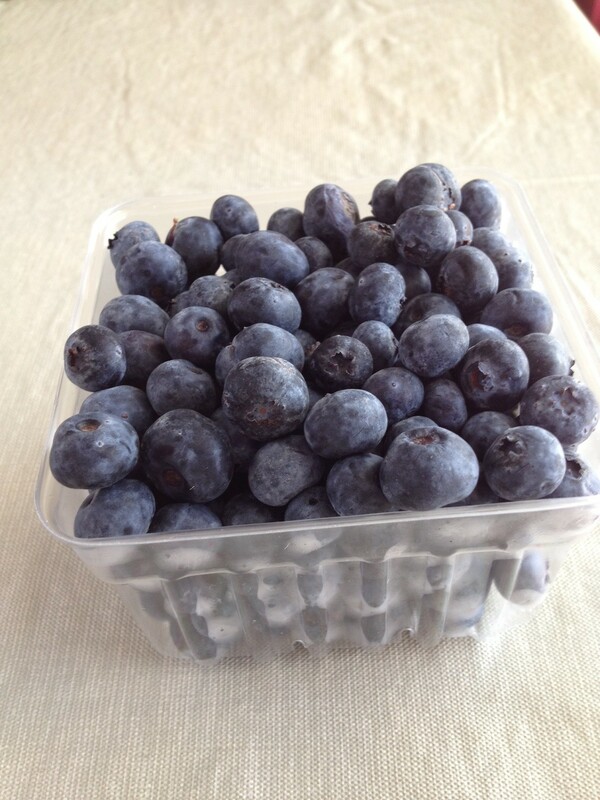 Also, a second trip to the Worthington Farmer’s Market led me to pick up these beautiful blueberries. Given that I am brand new to this cooking thing and even newer to baking, I had never actually purchased a blueberry before and had no idea exactly what to do with them. 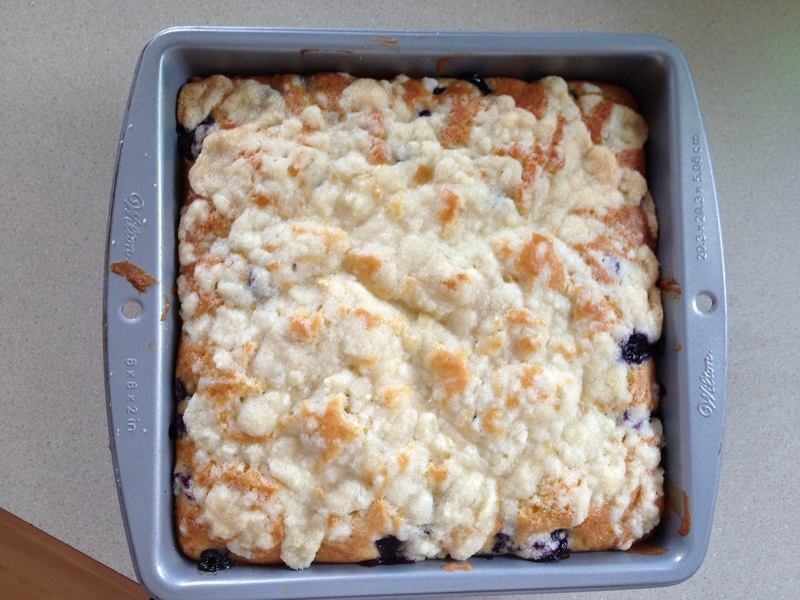 A quick search led me to a blueberry buckle, a dish I liked for the alliteration alone. Buckles are basically cakes with fruit mixed in or sprinkled on top. The original recipe called for half the blueberries mixed and half baked on top, but I got a little over-eager and thew all the blueberries in without seeing the word “half.” I am a big picture person and sometimes it works out okay. Not two hours after I made the buckle that I received my Food Network recipe of the day featuring Alton Brown’s own blueberry buckle. Imagine my excitement!! (Fine, summer’s a little slow chez Chef Juje.) Honestly, the one here is kind of extra delicious because it involves a lemon syrup on top. Make the crumble first and then freeze. Then make the cake and sprinkle the crumble (hehe fun sentence!) over top. While the cake is baking, prepare the lemon syrup and drizzle over the cooked cake. Also, I cheated and did not use lemon zest and used “Real Lemon” juice instead. I did just buy a juice attachment for the mixer, though, so maybe my cheating days re: lemons are numbered. Sift flour, sugar, salt and lemon zest (for you non-cheaters). 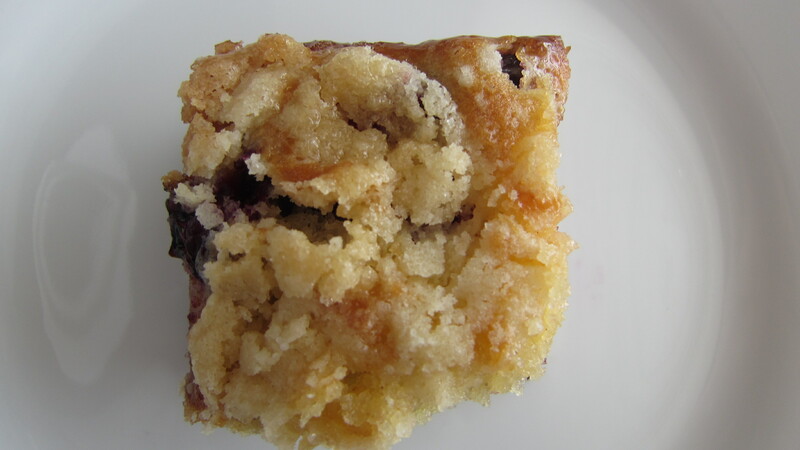 Mix in butter so that little crumbles form, then store in the freezer until the cake is prepared. In a large bowl (YES another bowl! ), sift flour, baking powder, baking soda, salt and nutmeg. In another bowl (oh yes…), cream butter, sugar and lemon zest. I used the beater attachment on medium for this. Add one egg at a time to the butter mixing bowl and mix after each egg. Add 1/3 of the dry ingredients and 1/2 of the butter milk. Mix. Add another third of the dry ingredients and the final half of the butter milk. Mix. Add the remaining third of the dry ingredients. Mix. Spread cake batter over square greased baking dish. 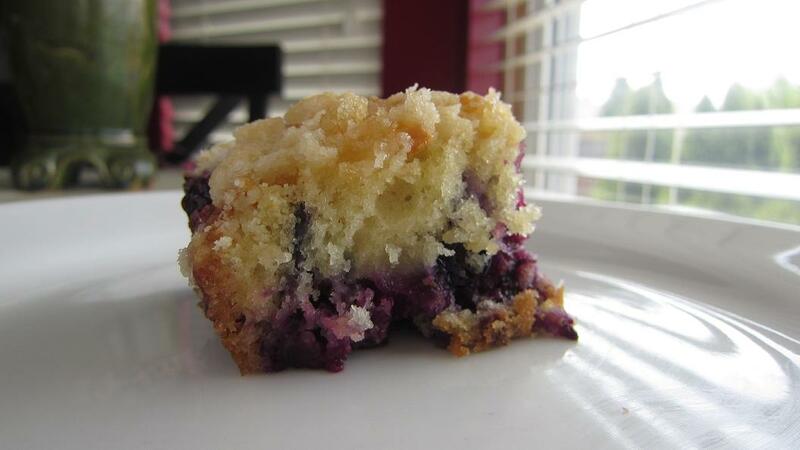 Sprinkle blueberries on top if you have them. Spread the crumble from the freezer over top, then bake at 350 until it starts to brown. Bring the sugar and lemon juice to a boil. Reduce to simmer and cook 8-10 minutes until a syrup has formed. 4.) Drizzle lemon syrup over cake. Cut and serve. I have heard that a lot of baking is measuring. I was very careful to measure each dry ingredient, pack it not-too-tightly, then even the top of the measuring cup using a back of a knife. This worked perfectly with the exception of sugar, in which I confused the 1/4 measuring cup and the 1/3 measuring cup. I’ve also heard of people measuring ounces. I would be open to this if I start baking enough to warrant a baking scale. Any preferences out there? Any other baking tips for a newbie baker? Phew, those were a crazy couple of months! And now, I’m excited to announce, that Chef Juje is now Mrs. Chef Juje. The last few months were just a whirlwind of wedding planning, traveling, wedding planning, visitors, finally wedding and eventually more traveling. It was all so much fun but I’m secretly excited to get back to the normalcy of every day life. Believe it or not, there is only so much champagne you can drink and hors d’oeuvres you can nibble before you start craving a home cooked meal. That threshold is quite high, mind you, but it exists and I’m excited to be back. Today I present our first meal as an official family of two. I found this recipe in the Food Network Magazine that was waiting for me post-honeymoon. I normally gravitate toward the fancy “weekend night” recipes because I like to make things as complicated as possible (you know this already), but this fell into the everyday cooking category and it’s just as delicious. Cut your avocado, scallions and cucumbers if you haven’t already. This makes life much easier for everyone. Rub fillets with with a dab of oil and salt. If you use skinless, rub both sides. Place in clear baking dish and bake five minutes. I put nonstick spray on the bottom of my glass dish because my filets had skin and were not oiled on the other side. I have no idea if this was necessary. After 5 minutes, remove fish and brush with the honey mixture. Return to oven and bake 7 to 9 minutes or until layers flake easily. It’s most delicious when center is slightly translucent. While fish is cooking, make the salad. Whisk rice vinegar, mayo and 1/2 tsp soy sauce and oil in large bowl. I whisked the heck out of it to make sure that the mayo was fully integrated into the oil mixture. At first it looked like there were tiny blobs of mayo and I don’t think that’s what you want. Add cucumber, scallions, salt and toss. Gently add avocado. I added mine piece by piece to avoid the salad becoming a guacamole. It’s been so long since I’ve blogged that I have a lot to say! First, I purchased the cucumbers and scallions at Worthington Farmer’s Market. Maybe it’s effort justification on my part, but foods from farmer’s markets just taste so much better and are so much more fun. It makes me feel like I’m one of those people who really savors life, you know? Second, I recently realized I have spent many years spelling avocado as advocado. Ha. I have to remind myself that the avocado is not advocating anything. 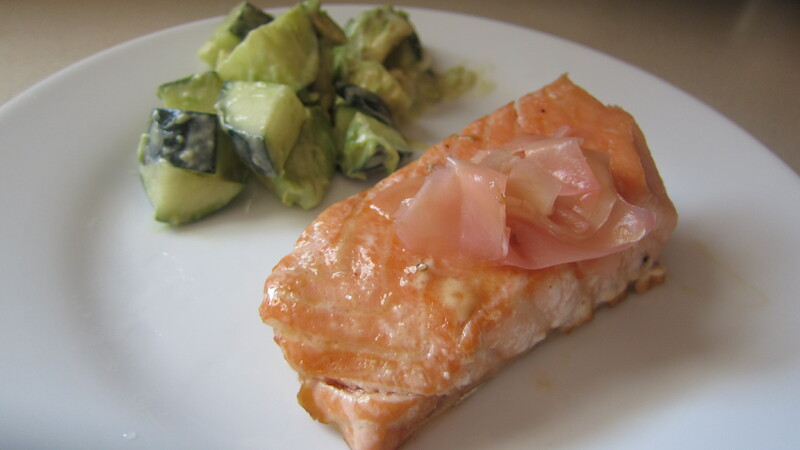 Finally, cucumber, fish and avocado work really well together. This makes sense given what’s in a lot of sushi but it’s nice to figure this out first hand.